Rosemary is considered to be the perfect herb to flavour lamb - roast or otherwise - but it also complements chicken or fish just as well. I love rosemary; I have a hedge of Tuscan Blue planted around a small sitting area in my garden as it helps to repel flies and mosquitoes - but not sandflies or midges, unfortunately. Only a flamethrower deters those little nasties. Just running your hands over a rosemary bush is enough to release the divine smell, as the leaves are full of a pungent oil. You can also make a rosemary and garlic butter by finely chopping the leaves from four sprigs of rosemary and peeling and crushing a clove of garlic. Mix through 125g unsalted butter at room temperature, then roll in a 2cm-thick log shape in a square of foil. Twist the ends closed and store in the freezer. Just cut a few thin slices off when barbecuing lamb, chicken or fish and put on the cooked meat when serving. It will melt and form a simple but fabulous sauce. Today's recipe requires overnight marinating to get the best result. If you're short of time, marinate for at least an hour. Remove leaves from two rosemary sprigs and set aside the remaining sprigs. Juice one of the lemons and set other aside. Combine chopped rosemary, lemon juice, olive oil, mustard and garlic in a glass or ceramic bowl. Season to taste with salt and pepper. Add chicken pieces and turn to coat. Cover and refrigerate overnight. Preheat oven to 200C. 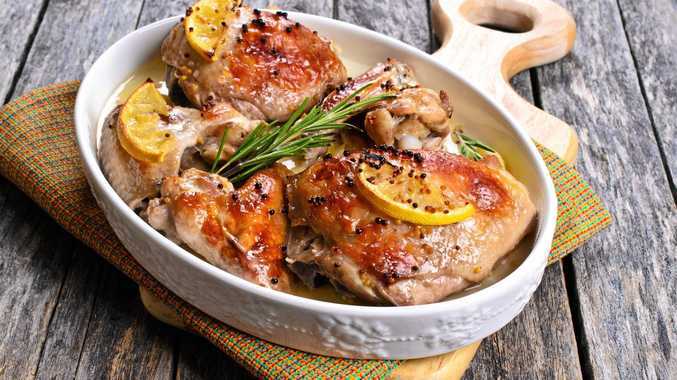 Place chicken in a roasting dish skin side up with the remaining rosemary sprigs and the lemon, sliced and with seeds removed. Bake at 200C, spooning pan juices over the chicken a couple of times, for 50 minutes or until golden and cooked through.